White houses with blue domes, and idyllic beaches with beautiful sunsets can all be found on the Greek island of Santorini. Located in the Aegean Sea, this volcanic island also serves as a great home base for island hopping. You can easily visit other popular spots in the Cyclades, a group of Greek islands southeast of the mainland including Mykonos, Naxos and Paros, or some smaller, less crowded islands, such as Folegandros. The tourist season runs from April to October, and the weather is typically great then for enjoying the beaches. Avoid the crowds in the busiest months of July and August though, and you’ll also save money. Hotel prices alone can go up by hundreds of dollars a night. 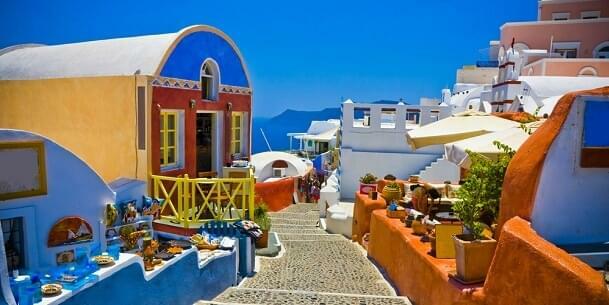 Though Santorini is not known as a budget destination, visiting at the right time will help. Flying there on an award ticket also helps: You can get there with miles from any of the three big airline alliances—oneworld, the Star Alliance and the SkyTeam. Santorini is served by Santorini (Thira) National Airport, located north of the village of Kamari. British Airways levies a huge fuel surcharge on flights between the U.S. and Europe. If you are traveling through London, you can save hundreds of dollars by flying on American Airlines across the Atlantic, then transferring to British Airways in Europe for the flight to Santorini since BA does not impose fuel surcharges on flights within Europe. If you can schedule your trip in April, the first half of May or the last two weeks in October, you can take advantage of American Airlines’ off-peak rates. Round-trip economy tickets during those times cost 40,000 miles. Alitalia is the only SkyTeam member that flies to Santorini. Flights are seasonal and routed through Milan. First class tickets cannot be purchased with SkyMiles. Economy award tickets to Santorini cost 60,000 miles with any of the airline alliances, unless you fly during American’s off-peak times at the beginning or end of Santorini’s tourist season. With AAdvantage miles, you can also get the best deal for business class seats at 100,000 miles. Business class on the other alliances would cost 115,000 MileagePlus miles or 125,000 SkyMiles.